This first week at La Selva has really flown by. I have just soaked up the wildness of it all without much of an agenda. I do show up for all 3 meals of the day and in the early morning as the sun rises I stroll within a half mile of my cabin to see what is feeding nearby. After breakfast I have been taking a different trail each day. With 4000 acres I am obviously not going to see it all, but I am marking my map to know where I've been. I'm finding more mosquitoes in my cabin so I use my essential oil bug repellent and continue to take Silver Shield for prevention of malaria. There's all kinds of different bacterias in this country than what my body is used to, so Silver Shield and Bifidophilus. are at the top of my "to do" list twice a day. 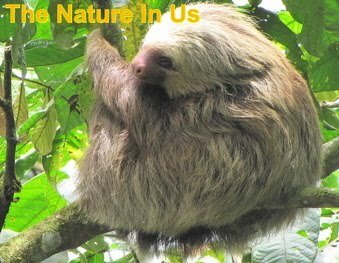 There is a lot of diversity of habitat such as old growth, swamp, rivers and "secondary and selectively logged forest." It seems similar to how they If it's anything like the way are doing it in Virginia. They take out a tree here and there, without the earth-moving equipment, for the needed lumber, but never clear cut. The intent is to leave the forest intact and viable for the wildlife. I saw one tree down that had been cut for lumber. Matter of fact there were a few boards there and they were obviously not finished. It wasn't a real healthy tree so they may choose one that is in the process of dying. Tomorrow I am considering a trail that will get into some swamp areas. My first thought is "crocodiles" and "water snakes." I may seem like a brave person, but it's just curiosity that keeps me going. I have the same thoughts as anybody would in the jungle and although I'm fascinated with snakes, they still make me nervous unless somebody is handling them. My next thought was, "but what a way to go!" I've always told Randal, my dear husband, that if I die on a forest trail I will enter Heaven with a smile on my face. As painful as a poisonous snake bite is, I'm not too sure I would be smiling and I never thought about being lunch for a happy crocodile. Although I've heard a few raindrops during the night, we've not had any daytime rain until today. It was the oddest thing. You could hear something "blowing in" and then in a few seconds it would be pouring down from the roof and the sound of it was quite melodious. As quickly as it would begin, it would stop. It was a good morning for birds and photos. The day began with 5 Rufous Motmots, a Crested Guan, and better photos of the Montezuma Oropendola, Collared Aracari and the Chestnut-mandibled Toucans. 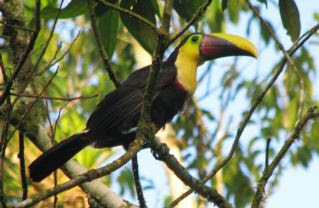 Randal and I have special memories of this toucan from our first visit to Costa Rica. La Selva is considered a "wet tropical forest" and today I experienced the definition of that. It would seem that some rain would cool things off, but here on the Caribbean side of Costa Rica, it just made it more humid which meant it felt even hotter. I spent the afternoon in my room with the fan going, which works well to keep me comfortable. 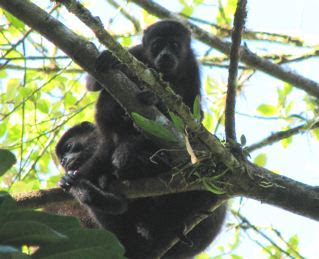 I've seen a sloth, agouti, huge Green Iguana, but I still love the Mantled Howler Monkeys. They are the loudest land animal with their calls being heard 3 miles away. It's certainly easy to know where to look for them if you just follow the sound. Yesterday one of the gentlemen here got a photo of a troop of them, mama with baby too, crossing the suspended bridge. What a delight that would've been to watch. At night when I return from dinner in the dark, I wonder what I would do if I met a wild animal coming from the opposite end of the bridge. After all, it's a great way to get across the river. We're not the only one with a brain. The bridge has been here for 26 years. My mind can get real busy while I'm walking about this jungle. When I see animal movement my first thought is puma (and it's a large ground bird or agouti). When I hear low rustling in the leaves I think snake (and it's lizards or small birds). It keeps me giggling at myself and each day brings a bit more courage to the forefront. I have hopes that this will change my life in many ways. I have begun wondering, "Who will I be when I return home?" I love change, so I'm hoping I will have changed for the better. I do know that it's not good to let fear rule your life, so I'm just stubborn enough to want to do something about it! 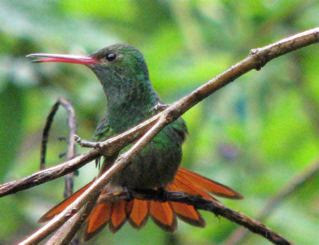 View La Selva photo albums and more.